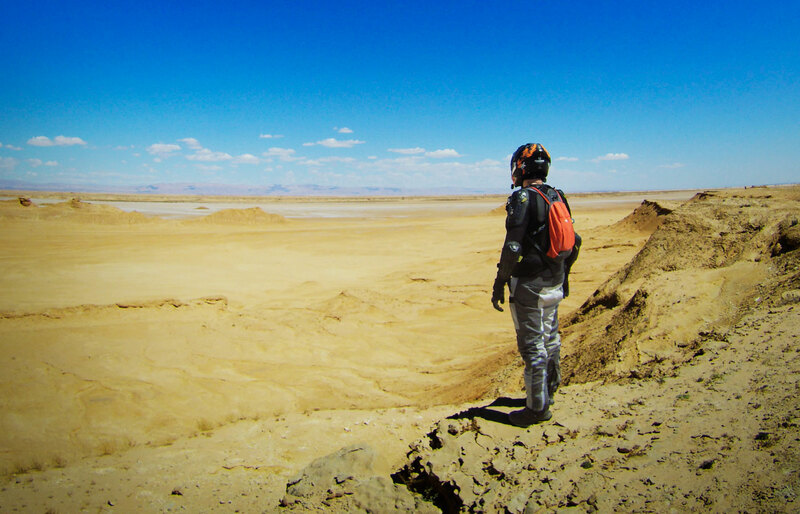 It’s the journey of 5 friends riding their motorcycles through a sea of ​​dunes and amongst the waves of the desert they discover some wonderful surprises…. 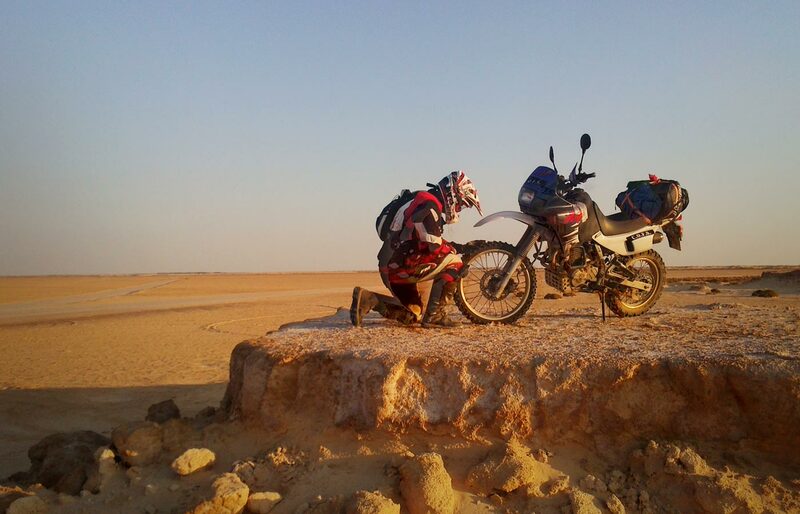 The Tunisian desert is a real challenge: to face it, you need to be humble, keep your head down and stay hunchback like a camel. We 5 travellers, on two wheels, discover it through a path made of wind, sun, sand, rain and rivers of sweat. We ride on dusty slopes to reach the dunes, we get covered many times and then learn to float on the finest Sahara dust. 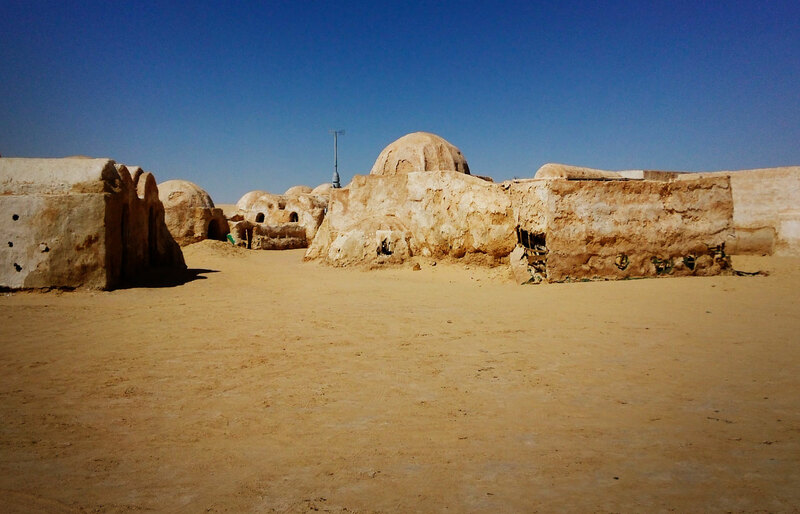 We drink tea in the desert and find traces of famous Hollywood movie sets. We encounter fresh oasis and palm trees, camels and curious dromedaries, we ride along a huge salt lake. And everywhere people reserve a special welcome, full of authentic Tunisian flavours. 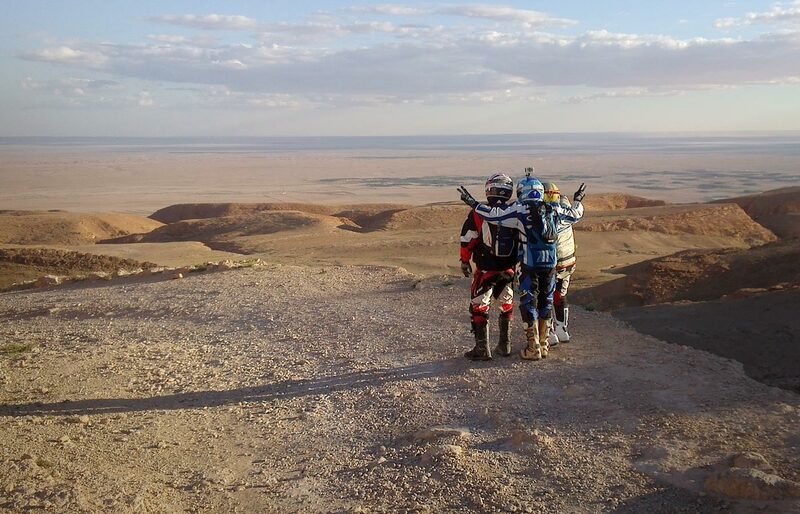 For me, Marco (nicknamed “The Giant”) and for my great friends Andrea, Marven, Samu and Riccio … there is no desert without dunes and there is no adventure without a motorcycle! 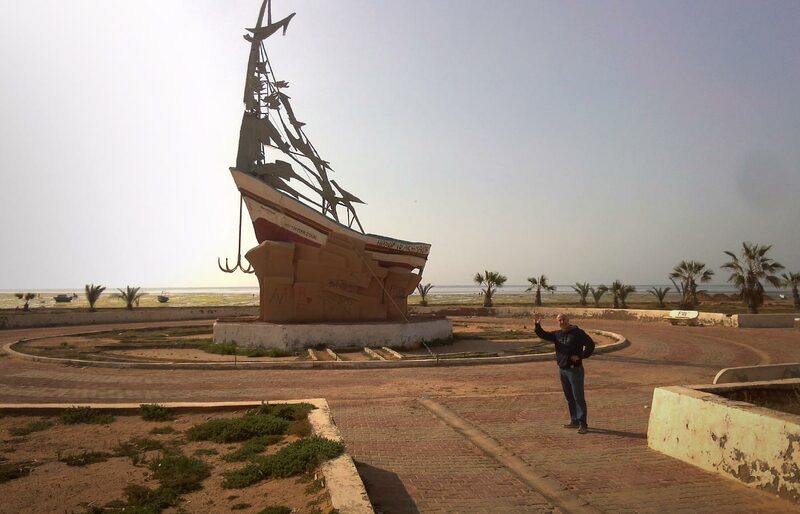 We study the trip carefully then take 10 days of vacation and sail to Tunisia! After landing at La Goulette, the port of Tunis, we encounter our first problem and it’s with Marven’s motorcycle: the crown is too big and the tyre is interfering with the swing-arm eating at the cleats, so we change the false mesh. 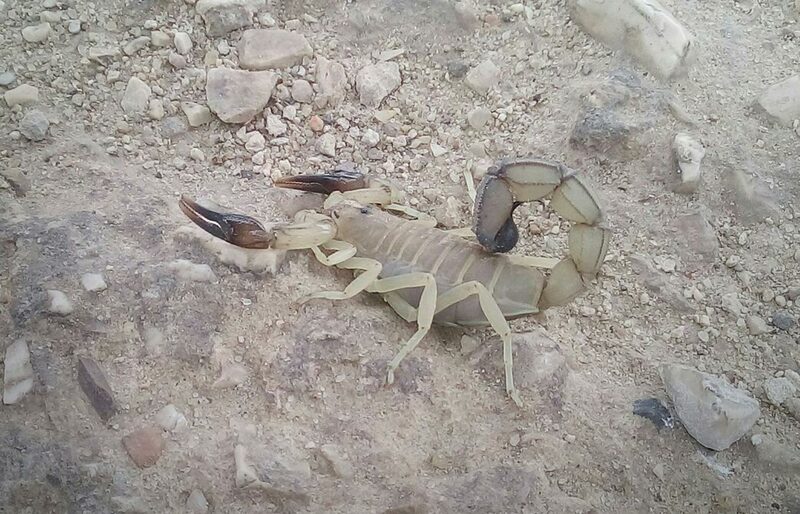 Finally, we drive along 550km of highway and reach Tozeur. The next day is our “sand baptism”: We head off track at Ong Jemel and we find the dune near Mos Espa, the filming location for Star Wars. Andrea explains the driving technique and how to pull the bike out in case it sinks into the sand: a great effort in this sand that is so fine that it feels like talcum! We reach the beautiful Camel Rock, then head for the Rommel Runway at Redeyef, running along the Great Salt Lake Chott El Djerid – extending for 5.000 km2 from Hèzoua to the west, Kebili to the east – and driving on a wonderful road consisting of cement slabs. At lunch and dinner we return to Tozeur: with mixed olives, tuna and the inevitable “harissa” (spicy sauce) with mixed grill on the menu. In the morning, we head off for Douz: Marven and I take the road parallel to the Libyan border for 70km, whilst the others take the track. We eventually find ourselves in Rjim Maatoug to have a “boga” (Tunisian soft drink). We continue along the C210 entering the slippery white salty stretch of Chott. 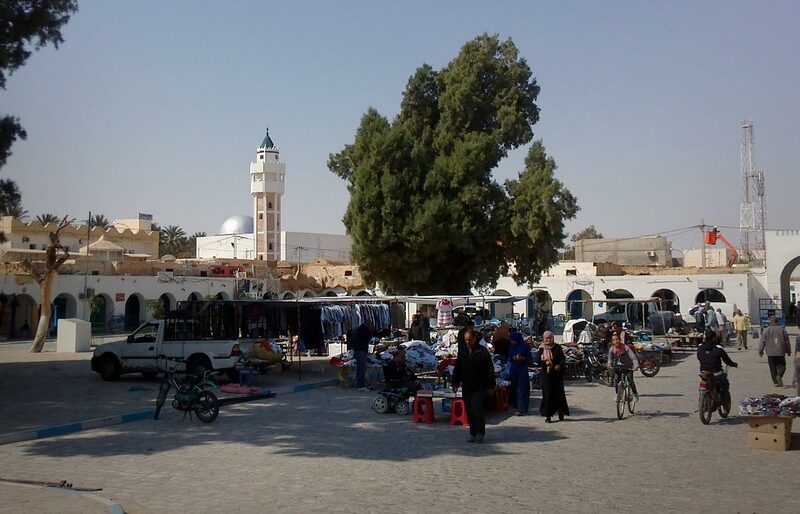 After a night in Douz, the first famous town overlooking the desert, we take a stroll in the main square while the laundry we have laid out on the hotel’s terrace has time to dry. Once again, we follow a very demanding and challenging off road track, which leads to the Jebil National Park. 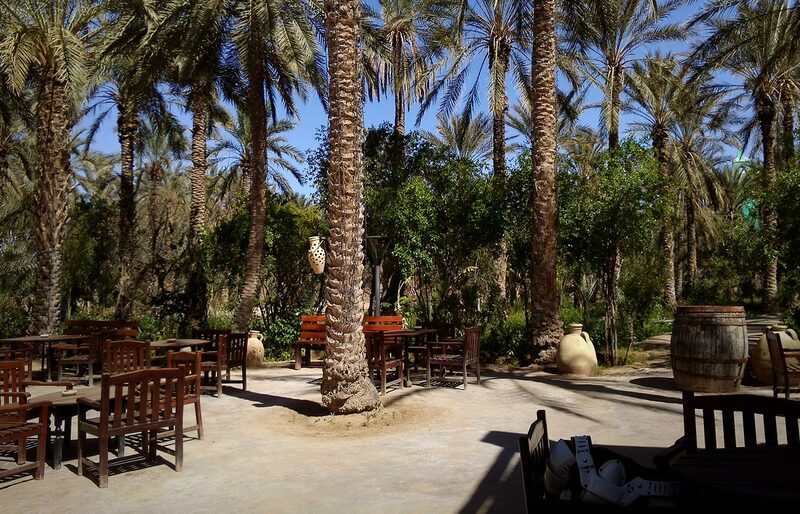 Travelling through the dunes, we stop for refreshment at the Café du Desert, dine at Café du Parc with a gentleman by the name of Mustafa and then return to Douz to dine at Restaurant El Bey, a real pearl in the palm grove. The following day we return to the Café du Parc, which we consider our base for exploring the park’s inner tracks. We take more than one tea in the desert, and all are delicious! 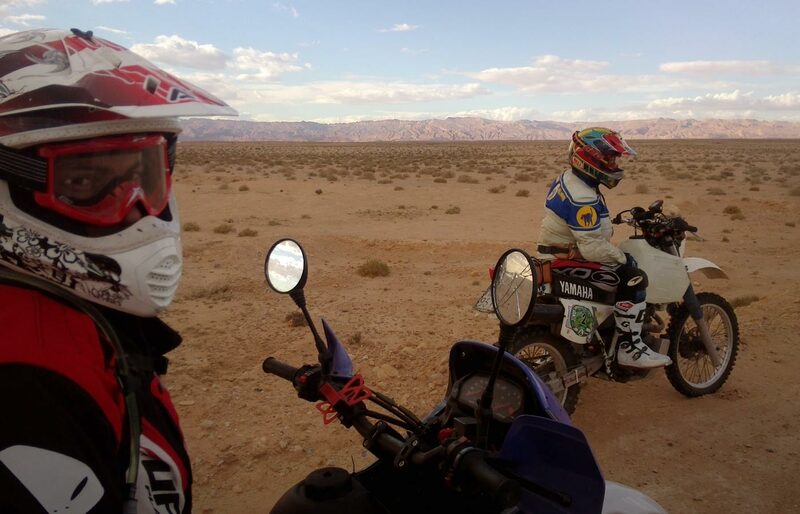 We spend some time working on the motorcycles, making small adjustments and repairs, then we eat from Mustafa in the company of 6 soldiers: the menu consisting of “ojja”, a typical egg and vegetable soup, camel meat, salad “méchouia” (tomatoes, peppers and onions) and “jefta” for a dessert. The morning after some bad weather we decide to make changes to our itinerary. 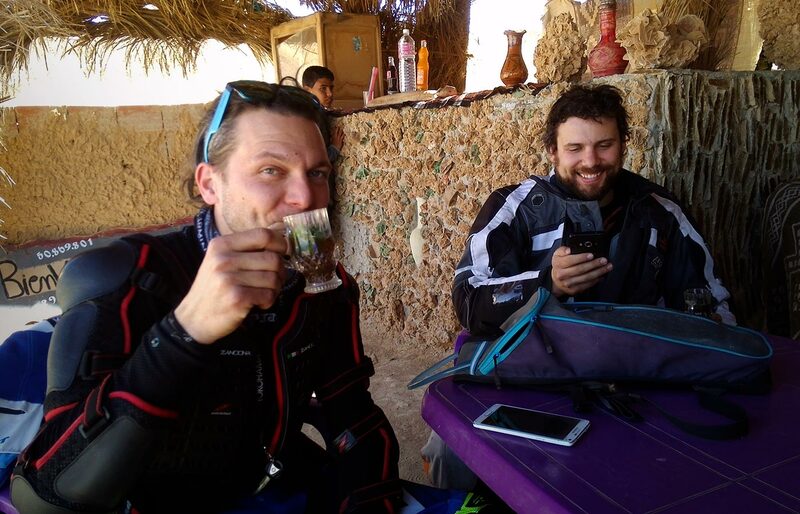 We salute Mustafa with a small gift that fills him with happiness – the spotlights from my motorcycle, which he immediately transforms into lighting for his bar – and in the afternoon we resume our travel by motorbike in Tunisia heading to Matmata. The path is narrow and treacherous, I end up in the sand several times and fall. Andrea sends the others ahead which sets the path for me. I regain speed and reach the rest of the group in no time. At Matmata there is a room in the rocks and a dinner with “chorba” and excellent chicken cous cous. When we awake the following morning it’s cold and the motorcycles have problems. We can still reach the fortified village of Ksar Hallouf and sleep in a cave on mattresses lying on the ground. At breakfast, we are roused by hot buns, homemade honey and jams, but it rains again, the wind blows and Riccio’s health is poor. We stop for a day and decide to resume the ride the next day. But the rain is incessant. While others wait for the best time to leave, Marvin and I are forced to resume the trip because the ferry awaits us. Via unappealing roads, streams of water, mud and debris, we travel to Mahares, a typical town on the coast. From here the next day we reach Monastir, a splendid tourist destination with the “Ribat”, the famous sea fortress. In a fast food place in front on the seafront, we enjoy a great “shawarma”, a typical dish, before heading to Tunis. 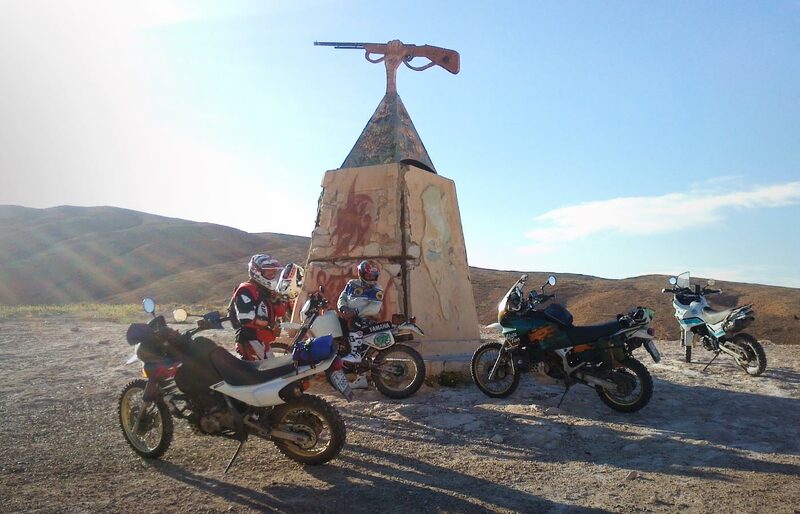 After 170 km, we reach La Goulette Harbour and board the ferry with the motorcycles. On our journey back home, every wave of the sea reminds us … of the fantastic Dunes of Tunisia! 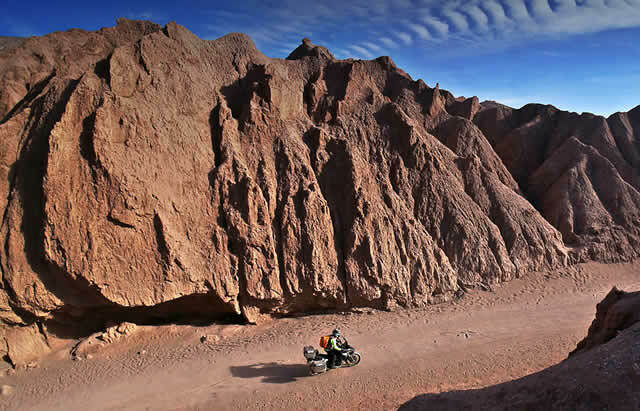 Due to his height, amongst moto-travellers, Marco Ficari, 41, is known by the nickname of “the Giant”. Andrea Accordino, 57, is the most experienced in sand riding techniques. Marco Venanzi, 47, called “Marven” has virtually been The Giant’s shadow on this trip. Samuele Gonnelli, 33, called “Samu”. Luca Ricci, 28, called “Riccio” is the youngest in the group. 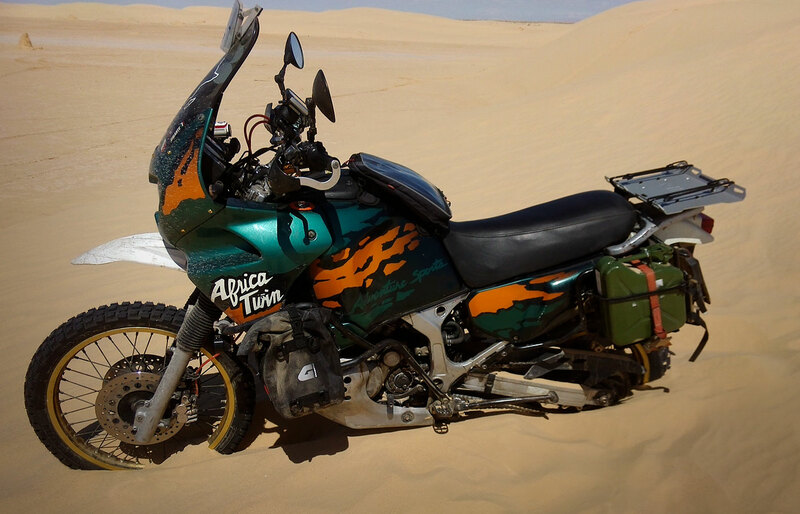 The 5 fantastic motorcyclists will ride: 2 Honda – Africa Twin and Dominator, 2 Yamaha – Ténéré and TT plus a Suzuki DR 600.